The US embraced and aided last year’s uprisings in the Arab world that overthrew the ruling regimes of Tunisia, Egypt, Yemen and Libya. The resulting chaos has only fueled the hatred towards America felt by many people living there. ­This bitter paradox has beome clear after the latest spate of violence and anti-American sentiment in the region this week. In three countries where leaders were ousted by the so-called Arab Spring with relatively little bloodshed, government security forces were forced to use tear gas to stop angry mobs of hundreds of people from ransacking US embassies. 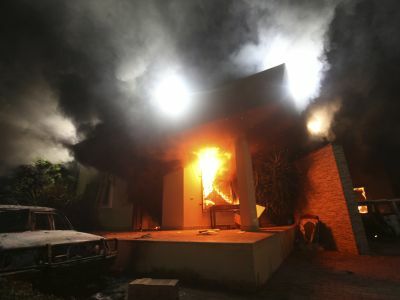 In Libya, which suffered during a US-backed civil war and NATO bombing campaign, the violence ended with four Americans killed, including the ambassador to the country. 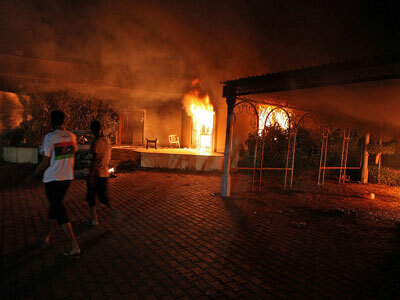 Tension is high in other Arab countries as well, like Kuwait, which is supposed to be America’s ally and friend. This time, the rioting was triggered by an amateur Islamophobic film, the latest in a string of incidents that have caused increased pressure in the region. This ranges from publicity stunts, like the Koran-burning by pastor Terry Jones; to offensive moves directed by ignorance, like the attempt to incinerate Muslim holy books at a US base in Afghanistan; to outright crimes, like the massacre in Afghan villages in March. “America has made a lot of blunders in the area and it has made a lot of enemies. Now with the US presidential race going on the rhetoric coming from the States is further inflaming the Arab world. So all it takes is a number of small incidents – this ugly film, a car crash or a statement by somebody – to provoke general fury,” war correspondent, columnist and author Eric Margolis told RT. But analysts believe that the roots of the conflict do boil down to bigotry. “This anti-Western, anti-American angst isn’t just about what this film was depicted as. This film will come and go. It will wash away. The real issue here is about the Western aggression – the violence and killing – from Afghanistan all the way to Libya,” Patrick Henningsen, geopolitical analyst for current affairs website UK Column, said in an interview with RT. The hatred comes from decades of American foreign policy that may be simply shortsighted, or utterly immoral, depending on the reasons behind it. The US has left violence and suffering in its wake in the Arab world whenever it suited its political goals. Sometimes directly through military intervention, but more often indirectly by taking sides in internal conflicts with little regard for long-term consequences. 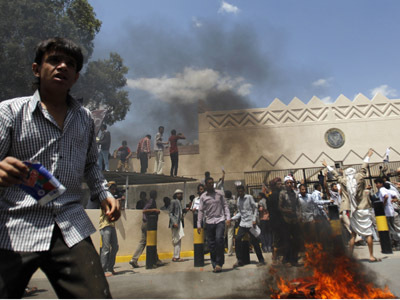 “We saw what happened in Afghanistan and Iraq after the US invasion – the clashes between Sunnis and Shias. We see what’s happening now in Syria, where the sectarian violence is being supported from the outside – from the Gulf states, from the US, and from France. And it’s what’s happening in Libya,” global affairs researcher Benjamin Schett said to RT. The fact that the killing of US Ambassador happened in Benghazi – the cradle of the much-praised Libyan revolution – and that Christopher Stevens was one of the US officials who helped the current government wrest power from the late Muammar Gaddafi, only adds to the sad irony. America’s immediate response to the violence was to send two warships to Libya’s shores, while speculations rose that Gaddafi sympathizers or Al-Qaeda infiltrators were the perpetrators. But the sad truth is that Arab Spring brought radicalization rather then democracy, and this cannot be fixed by a secret Navy SEAL raid. 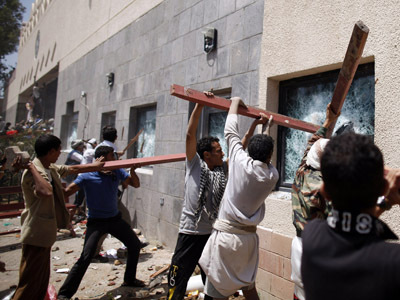 “It’s not clear even if the US wanted to retaliate for this kind of actions against its embassies. It’s not exactly clear how they would be able to do that or who particularly they would be targeting,” James Corbett, editor of the Corbett Report told RT. Unfair though it may be, all Americans are on the receiving end of this hostility, not only those making the decisions. In a sense, it’s understandable: Foreign policy is of little importance for the average US voter, frighteningly so for a democracy as powerful as the US. “Americans are responsible for policies in the region… We have to speak out when our government does not act in a democratic universally acceptable manner. When we overthrow governments like we did in October in Libya and install puppet regimes, we will be targeted, rightly so,” author Colin Cavell said.